Geez it just gets better and better! Just when I thought that maybe we were seeing light at the end of the tunnel with our leaders, they go and do something stupider!!! This nice lawyers letter was received by this office on Friday, and as a subsequent we have removed the letter as Censored. This particular posting, having been viewed 8,423 times since it was published, has been removed. It should be noted that I have no idea where the letter in question and the subject of this lawyers letter, came from. I found it in my mail box in a plain white envelope with a request to post. The subject letter was a copy of a letter to the Mayor and Council from the Manager of Public Works, explaining the bad situation and working conditions experienced by her under the Direction of Rhonda Cook. Adolf Close intends to achieve his objective one way or another!!! He, the spineless wonder, voted in support of Janice Jackson’s motion to stop funding Rhonda’s litigation against this blog. This is the same guy that started the fiasco in the first place. They have pissed away between 50 and 100 grand so far as we can tell as the budget is as clear as mud!! Now it appears he intends to try another way!! We need a Reset Button on the last election!!!! I guess they feel they will have plenty of $$$$ to pay the lawyers what with the people on the Amabel-Sauble water system paying $10.77 per m3 for their water. Common Sense has been beaten silly here on the Bruce. I have also tweeted the links, and posted them on reddit and 4chan. I have also mirrored the blog, bruceonthebruce.com (I have a few *other* deleted pages) locally, and if this nonsense continues, I will simply mirror the whole blog on the hong kong site. ianal, so I’m curious as to what legal authority you feel the town’s lawyer has to ask that the document be removed – there certainly couldn’t be an assertion of copyright, as the author of the letter holds that right. So I realize that you have removed it as a courtesy. Also, did you decide not to publish my previous comment in this thread and another? I ask, not because I’m *offended*, rather so I don’t repost it. Additionally, I have mirrored the blog, bruceonthebruce.com (I have a few *other* deleted pages) locally, and if this nonsense continues, I will simply mirror the whole blog on the hong kong site. I must of missed it please repost. Yes I removed it as a courtesy but also to amplify the fact that they are trying to censor!! I believe wordpress was having an issue with hyperlinks, so the post wasn’t being submitted. It’s the post just above your reply, so all is well. I would be inclined to attempt to contact the author of the letter and get their permission to post it. It certainly does not indicate anywhere on the letter that it is ‘confidential’. Also, and I know it is like cutting off your nose to spite your face, but I really do hope that you continue with your legal assault on the Town. Only quiters loose and only Loosers quit!!! If we never had a CAO then the MPW letter would not have been written and another payment to a lawyer would not have come from the taxpayer’s pocket. At a guess it is a $500 minimum to write a lawyers letter. Waste of time and money. If we never had a CAO how much money and time in closed session would have been saved in the last two years since the start of the last hiring procedure? How much money in legal fees ? If we never had a CAO for the last 10 years since 2002 how much would we have saved? Could we have done it? A qualified yes-with a smaller government structure. But there were a lot of other issues in the last decade that wasted money it is hard to decipher all the variables in hindsight. Are we overspending? Just how big do we think we are? Just how big do we think we are? Gord MacDonald is right we could save a lot of money and reduce taxes right now. The CAO and EDO positions rightly belong in cities with 50,000 population. We already have Bruce County Tourism why are we trying to run in redundant mode here at the town level? Why is the CBO pushing an expensive and needlessly complicated septic inspection program? Don’t even get me started on the Strategic plan. It hangs out the idea that spending and dreaming somehow brings the outdated growth concept to life that we will achieve utopia in 10 years.There are so many ways to waste our money in there it would be like hiring a second CAO for the next 10 years. For what exactly? To train a skilled trades workforce for Alberta? This town runs on a residential based taxation system and it is good enough to do a fine job of delivering basic services if it is structured right. We have lumber yards, grocery stores and money coming in to pay carpenters and plumbers and sheet metal trades to work on housing and home improvements. Residents pay most of the bills. Motels are closed in winter the EDO has never changed that. It is what it is. Just how big do we think we are? We have a good bunch of experienced people on Council let’s have a better look at the budget. It should not get an affirmative vote the way it sits now. I look forward to better management strategy from Council and with that no more need for lawyers and letters. You have the experience and Turner and Kirkland no longer dominate. The inexperience mistakes such as no recording in meetings are in the past. Time to go outside the box. Just how big do we think we are? The progression of unchecked “entitlement”? Or is it “unchecked” entitlement? Get up,Stand up, don’t give up the fight. The person who wrote the February 15 complaint letter should have control over whether it is posted or not. 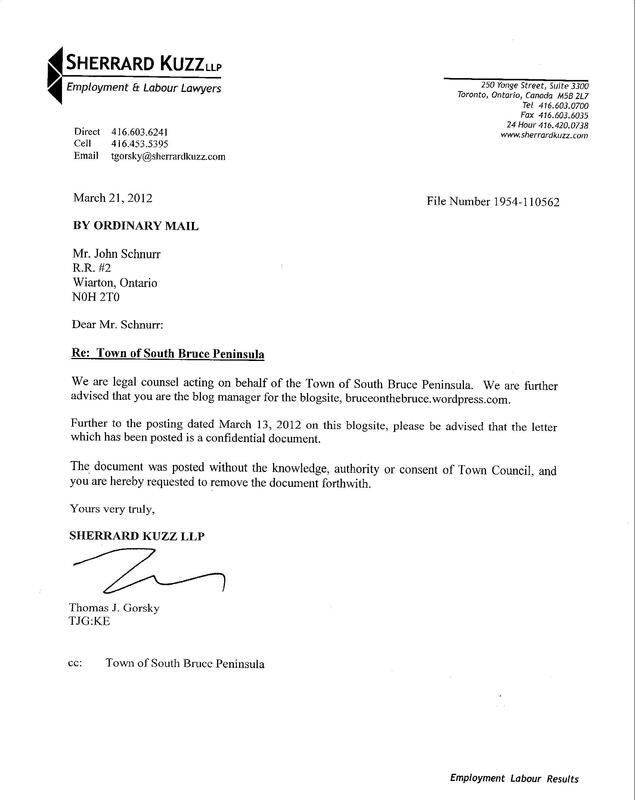 Unless the town is prepared to say that the letter as posted was illegally given to Bruce by a staff member or a council member, then the town has no say in the matter and had no business sending the March 21 lawyer’s letter. You would think that with the strong public support for Councillor Jackson’s March 20 stop-the–nonsense motion, the gratuitous, tax-funded harassment of citizens might have ceased. I believe council was completely unaware of the lawyer’s letter. Someone acted without council authority. That person or persons should be held accountable. The excuses will be pathetic. I agree. Who is the town to dictate! Did you notice it is a different law firm that the one handling the legal action against the ‘blog’? When did this firm take over? Are they on the ‘list’ for hiring? I don’t think it was up for tender!! Rhonda Cook no longer employed by the Town!